← Stopped by an airsoft game at Bad Karma field. Leader 50 finally enters productions. Last week, I went to Micor Defense in Decatur, AL with Charles St.George and other colleagues. We test-fired the updated Leader 50 and looked at the first parts produced for the initial batch of rifles. We chronographed the gun, tried it with scope and red dot sights. Since the rifle is short and light enough for off-hand firing, a red dot is a good option for CQB use. 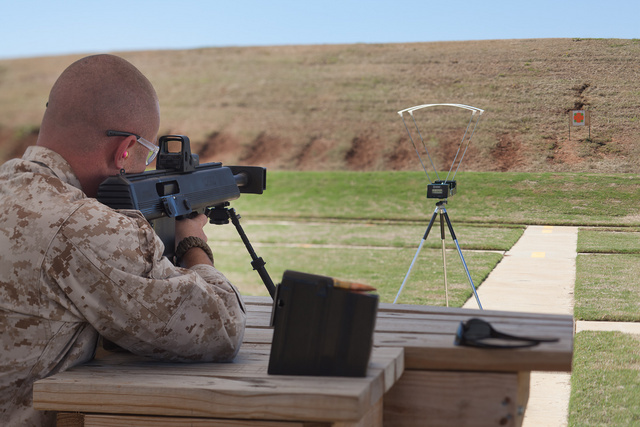 Shown with lightweight Atlas bipod. 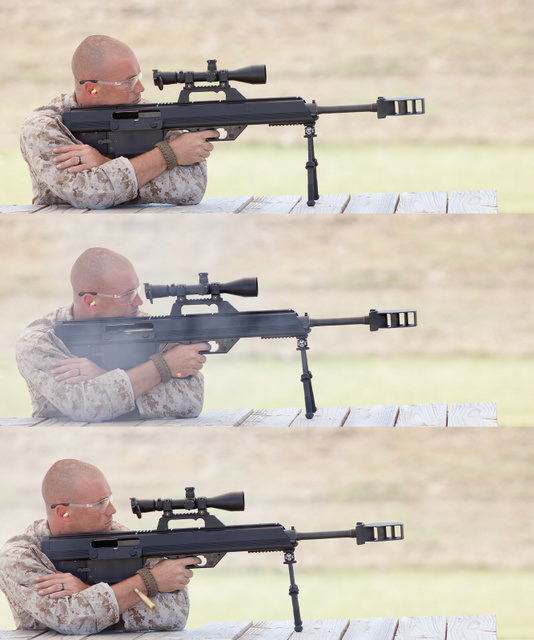 Average velocity with M33 ball from the 24″ barrel was right under 2800fps. The production rifle will look different in minor details, but the design is pretty much finalized. You can pre-order it now for early 2013 delivery. This entry was posted in rifle and tagged 50BMG, Leader 50, semi-auto. Bookmark the permalink. 11 Responses to Leader 50 finally enters productions. CQB with a 50 cal? Really? Hate to pay your dry cleaning bill…. CQB doesn’t always mean room clearing — could just as easily refer to digging out a a barricaded foe by going through the barricade instead of around it, or stopping a vehicle before it runs over you and your own roadblock. Ranges under 100m where ability to aim fast is important. I hope that comment about CQB use was tongue in cheek. 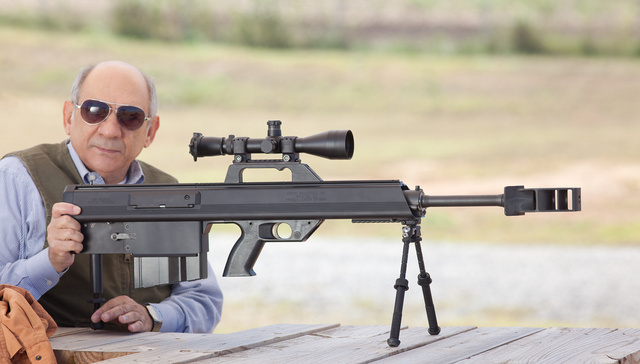 Who doesn’t need a semi-auto bullpup .50 cal! I saw 1,999 and almost pooped. Hands on the wallet and I look over and see 7,999. =/ Will .50 prices every get lower? For 8 grand I could buy a small armored truck and drive my my bullets over to the enemy. Very nice weapon system though. I am so glad I’m a leftie. That and the price make this something that can’t tempt me. A left-handed version is planned. Also, with regard to the report, it is no louder than any other .50 BMG rifle with a muzzle brake. It should be accurate thanks to the truly free-floated barrel (which is rare in gas-operated guns) but we shot ball and most of the firing was done by the designer. He’s not much of a precision rifleman by his own admission. With EOTech at 50 yards, bullets holes were touching. We’ll fire it for accuracy this month and report the results with various ammunition brands, ball and match.